This July, Google is flexing its muscles and rolling out a change to the Chrome app that will affect people using the popular browser. It’s not the first time that Google has impressed their agenda on the world, *ahem* responsive design *ahem* and this time they’re working for a more secure Internet by alerting users to websites that lack security protocols. 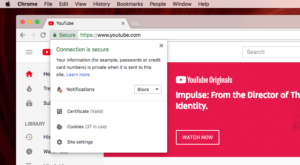 Next month every website without an SSL Certificate will be predicated by a “Not Secure” message before the URL in the top of the browser window. If you have been putting this off, now is the time to install an SSL Certificate. SSL Certificates encrypt information sent from the user to the server and verify the identity of a website. SSL Certificates are third-party verification systems that ensure all transmissions, from credit card information to email forms, are protected. Example of what a Google Chrome user sees on a site without an SSL Certificate. Example of a site with an SSL Certificate installed. 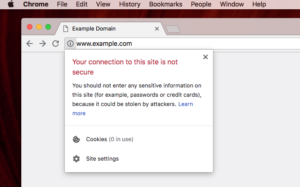 If you do not have an SSL Certificate, Google will indicate this with a “Not Secure” message at the beginning of your website’s URL path. These notices have the power to deter potential users away from your site. Cybersecurity is extremely important for many people and seeing “Not Secure” may have a serious impact on the number of clicks you get from the search results page, or the number of conversions completed and the perception of your brand as a whole. This is an additional push by Google for the total adoption of SSL Certificates by websites everywhere. In 2014, they modified their algorithm to place an emphasis on sites using SSLs. Upgrading to an SSL could provide a boost to your search rank and website traffic because of the SEO benefits in serving your site securely. It’s easy to see if your site has an SSL Certificate Installed. Just type in your URL and if “//” is the first thing you see, then your site has an SSL Certificate installed. All eCommerce sites that transmit sensitive data like credit card and identification information should have encryption. 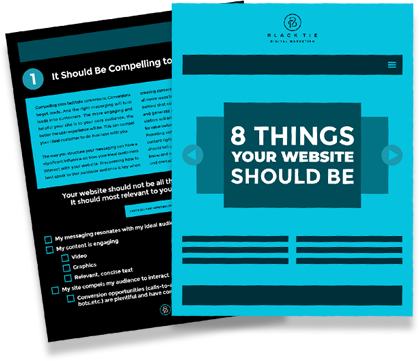 Many brochure sites that simply explain products and services are lacking these certificates. If you have a form on your website to collect email addresses or user information you’re going to need an SSL Certificate as soon as possible. The installation of an SSL Certificate is non-negotiable. The effect of lost search rank alone should have you clamoring for one, but the negative brand perception that comes from an unsecured site should worry you as well. Installing a SSL Certificate is relatively easy. Contacting your domain registrar (like GoDaddy) and requesting the SSL Certificate is a good way to start the process. These certificates generally cost around $75 and require yearly renewals and verification. The certificate will ensure that your users’ information is protected and that your search rank will not be affected.